The investigation of imaging properties of new digital detectors such as imaging plates (used in computed radiography, CR) or flat panels (used as film replacement or in computed tomography, CT) showed energy dependent unsharpness effects. This image unsharpness has essential influences on applications in NDT. 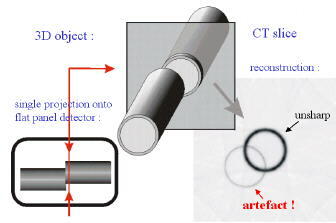 Particularly, in CT the precise knowledge of the detector unsharpness characteristics is critical for the evaluation of resulting images in NDT applications. For this reason edge response functions have been determined in dependence on radiation energy as a measure of imaging unsharpness. This analysis reveals a superposition of two distinct unsharpness effects: one effective within a short range (low unsharpness) and another one covering a larger area (high unsharpness). This has considerable consequences to quantitative analysis of unsharpness, as determined either by edge or slit imaging or by MTF calculations. Particularly at lower spatial frequencies the MTF decay is influenced, i. e. the unsharpness is spreading over a larger distance in the X-ray image. At higher spatial frequencies the MTF decay of the detectors does not show any peculiarity. Spatial resolution as measured by line pair or duplex wire IQIs is dominated by the short distance effect. The long distance one can hardly be detected visibly in film images. However, the long range component is clearly measurable for digitised films, for imaging plates and also for flat panel detectors. The long range unsharpness is also one of the major effects, which are responsible for distortions in 3D-CT. MTF and edge response measurements are described for determination of additional unsharpness functions by scattered radiation from material adjacent to the detector layer, e.g. flat panel casings, film and CR cassettes. 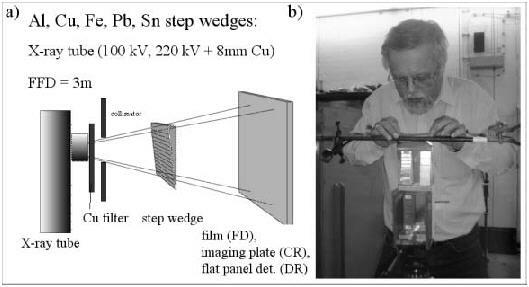 Fig 1: Experimental set-up: a) scheme (distances: step wedge - detector 200 mm, tube - detector 3m), b) photograph of the step wedge set-up (film adjacent to the wedges). 220 kV tube voltage and 8 mm Cu pre-filter at the X-ray tube. The measured X-ray spectra are given in Fig. 5a. The investigated objects, side-edges of step wedges from Al, Fe, Pb, Sn and Pt, were either located adjacent to the detector or in a distance of 200 mm in front of the detector. Step wedges were chosen to study additionally the influence of the penetrated wall thickness on the edge response. An AGFA D4 Vacupac (digitised with 50 ľm pixel size), a CR system FUJI XG-1 (100 ľm pixel size) and a flat panel detector AGFA DirectRay (139 ľm pixel size, direct conversion based on amorphous Selenium, am-Se) were used as radiation detectors. Edge profiles of an aluminium step-wedge in dependence on the object detector distance are shown in Fig. 2. An explanation for the distorted shape is given below in Fig. 3. Fig 2: Profile plots of digitised films (grey value proportional to optical density and inverted, i.e. dose proportional), Al step wedges (thickness 5 --25 mm), a) - c) step wedges adjacent to film, d) - f) 200 mm distance between wedges and film, film focus distance 3m, b), e) step profiles, c), f) edge profiles. Fig 3: Explanation of measured intensity profiles of the edges in Fig. 2 (wedge adjacent to film), a) only absorption (no scattering), b) only scattering contribution, c) resulting overall intensity. The detector (regardless if film, imaging plate or flat panel) receives any radiation from all directions in space, without distinguishing between primary and scattered radiation. The latter one is most intensive at the object surface and decreases from there on in all directions with the square of the distance. Thus scattered radiation is most disturbing if objects are close to the detector. This effect can be measured preferably at edges. Outside the shadow of the object X-ray radiation hits directly the detector and scattered radiation, generated within the object, adds to the dose received. Inside the shadow close to the rim scattered radiation is lacking from absent mass outside the object body. This results in an edge enhancement as shown in the experimental results (fig. 2a  c). By increasing the distance between object and detector (200 mm in fig. 2 d - f) it is possible to reduce the scattered radiation from the object according to the 1/R2 distance law so far, that it has no noticeable influence on the detector. It increases with rising radiation energy (the ratio between photo absorption and Compton scattering shifts with increasing energies in favour of Compton scattering). It depends on the material, largest effect for Al, reduced one for Fe and Cu, not detectable for Pb and Sn (i.e. scattering dominates at material with low absorption). It depends on wall thickness and decreases with increasing wall thickness. It applies to all detectors (film, imaging plate, flat panel) and the effect depends on the object and its distance to the detector. This kind of effect is discussed also in /1/. Fig. 4 shows the result of a Monte-Carlo simulation of the radiation transport for the primary and the scattered radiation. This simulation is in agreement with the measured effect. Fig 4: Monte-Carlo simulation of radiation transport including object scattering, with MCNP 4C code, 10 8 photons, focus object distance 3m, 200 keV mono-energetic radiation, 5 mm thick Cu edge object, 0,1 mm /bin, a) detector direct behind film, b) 200 mm distance between object and detector. As a consequence of the effect of object scattering, it is necessary to observe a minimum distance between object and detector or a suitable intermediate filtering. This will reduce the distortion of edge responses by scattered radiation (long-range influence in the range of some cm!) from the object. In addition to the scattered radiation originated from the object further scattered radiation may be generated directly in the vicinity of the detecting layer inside the detector casing that also influences the edge response. In Fig. 5 the altering edge response of a Pt or Cu edge is shown depending on the radiation quality. A film AGFA D4 Vacupac was used as detector. Caused by the small thickness of this detector (0.6 mm overall thickness: plastic bag, 2 lead screens and the film itself), the effect of scattering inside this detector is low and no substantial difference can be seen in fig. 5 between 100 kV and 220 kV + 8 mm Cu. In contrast, Fig. 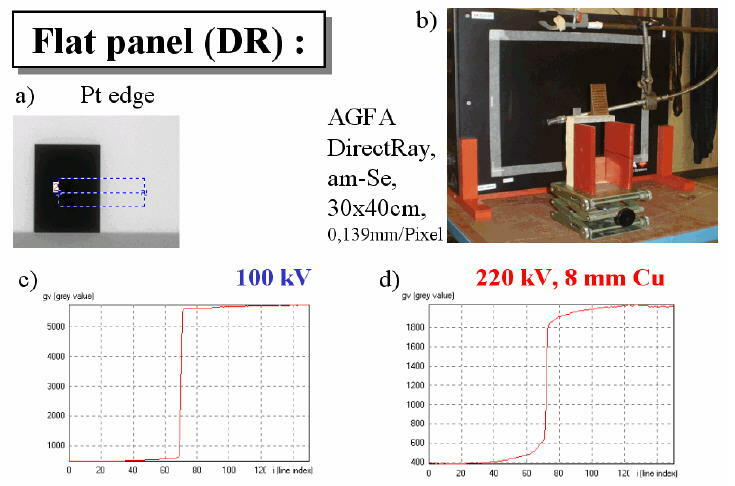 6 shows edge profiles visibly modified by the radiation quality (from 100 kV to 220 kV + 8 mm Cu) in case of the flat panel detector AGFA DirectRay. Symmetrical spurs (wings), spreading over larger distances in the cm-range, are generated increasingly with raising radiation energies. The total thickness of this detector is about 45 mm (4 mm carbon fibre composites (CFC) protection plate, 0.5 mm Se detection layer, several glass layers with detector electronics, as well as electronic boards and a mm-thick Pb-layer to protect the electronics from X-ray radiation). 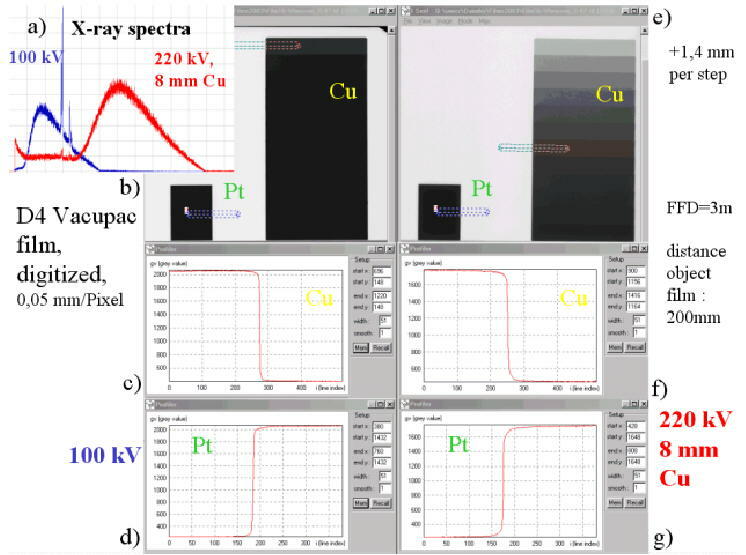 Fig 5: Radiographic images and profiles of a Cu edge (thickness c) 1.4 mm, f) 9.8 mm) and a Pt edge (7mm, d and g), at 100 kV (b-d) or 220 kV + 8 mm Cu pre-filter (e-g), a) measured X-ray spectra (0 to 250 keV). Fig 7: Profiles of radiographs of the Pt edge at identical exposure conditions as in Fig. 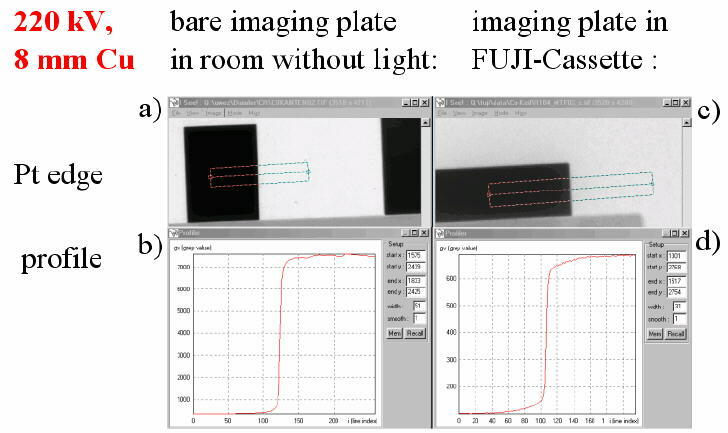 5 and 6, but with FUJI CR system XG-1 and imaging plate ST-VI as detector (a)  b) bare imaging plate in darkened room, c)  d) imaging plate in FUJI cassette, optimised for medical applications). A similar effect was observed for imaging plates when using with CFC cassettes without Pb screens (see Fig. 7). Symmetrical spurs on the edge within cm-range are generated by the adjacent cassette, which is provided for easy handling and automated read-out by the CR reader. For comparison, the Pt edge response was studied with a D4 Vacupac film, having the film directly behind the CFC protection plate that has been dismounted from the flat panel detector (see Fig.8). An increasing effect on the spurs is evident like in CR cassettes. The flat panel with and without the CFC protection plate did not show any difference. No further influence could be seen by the protection plate. This gave reason to assume that the scattering effects were generated from scattering layers within the detector. Fig. 8 shows the influence of cassettes and objects near the detector on the edge response profiles. This is a simple test for the determination of additional scatter unsharpness from the environment surrounding the detector. While the image sharpness of the edge (or slope of the edge function) is determined by scatter effects within the detector layer itself (inner detector unsharpness, Fig. 9a), an additional scatter contribution is arising from detector surrounding material layers leading to a secondary, strongly smeared image of the radiation profile in the detector plane (Fig. 9b). The superposition of both scattering effects results in an edge profile as measured (Fig. 9c), i.e. a steep slope at the edge rounded with extended spurs. Such an superposition has not yet been reported in literature nor any theoretical description, e.g. by Monte-Carlo simulations of the scatter contributions (in analogy to /2/). The described effect can be also measured on flat panel detectors from other manufacturers and with different working principles than described here (e.g. indirect converting flat panels by Perkin-Elmer or Varian with fluorescence screens as radiation detector). Fig 9: Explanation of measured intensity profiles of edge radiographs in Fig. 8 (object distant and protection plate adjacent to film), a) only absorption (no scattering), b) only scatter contribution, c) resulting overall intensity distribution. While the effect of long-range spurs is evident in the edge response function (see Fig. 10a), it can be neglected for the corresponding line spread function (see Fig. 10b, by differentiation of the edge spread function). This is the result of the high-pass property of the derivative. 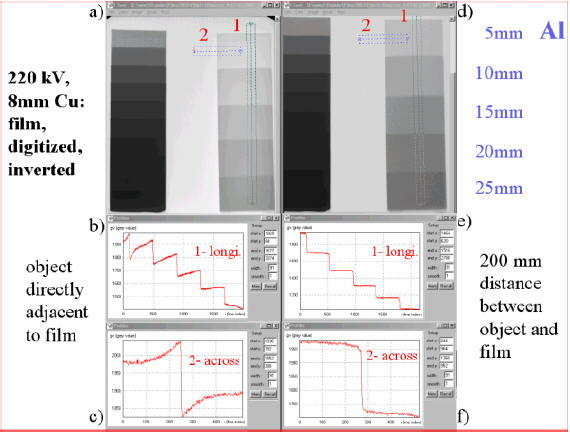 Fig 10: a) Measured profile and fit of the Pt edge function, acquired with an am-Se flat panel, consisting of 2 constituents: steep slope for low detector unsharpness and flat rising slope caused by scattered radiation from detector casing, b) measurement and fit of the line spread function, calculated by the first derivative of the edge image a). Fig 11: MTF calculation by Fourier transformation of the two fit constituents from Fig. 10b (slit image, a), in comparison to the measured MTF's of the am-Se flat panel at 100 kV (b, red) and 220 kV + 8mm Cu (b, green). The normalized magnitude spectrum of the Fourier transform of the line spread function (the modulation transfer function, MTF, see Fig. 11) reflects the long-range spurs of the edge profile as steep decay (like a peak) at low spatial frequencies. Usually the value of the 20% MTF decay is taken for determination of the spatial resolution of the detector. This characterises (without disturbing influences) the inner detector unsharpness (i.e. the steep slope of the edge). The 20% value of the MTF is shifted considerably to lower spatial resolutions by this additionally scattering contribution, i.e. the spatial resolution of the detector is apparently reduced. The long-range spurs of the edges caused by scattering parts within the detector device raise additionally artefacts in the reconstructed images from 3D-CT equipment, whenever flat panel detectors are employed together with higher X-ray tube voltages (> 200 kV, as usual in industrial applications). Artefacts, pretending apparent material closely outside the real object, are generated in the CT reconstruction result (see Fig.12), or vice versa, in thin walled regions more transparent material or even a cavity may appear visually. Solutions for this problem are discussed in /3,4/. Compensation of the long-range constituents of the unsharpness caused by scattering within the detector device, e.g. by deconvolution, can be achieved successfully if the radiation quality (radiation spectrum) depends only marginally on the position in the detector plane, if hardening effects from dense material layers can be neglected. Fig 12: Generation of additional artefacts in 3D-CT images, reconstructed from cone-beam projections taken with flat panels. The intensity transfer between reconstruction layers is originated by long-distance scatter effects in the flat panel. Only one cylinder really exists in the displayed reconstruction layer! Depending on radiation energy and/or material layer thickness, superimposition may enhance or compensate the observable result, or make it appearing asymmetrically. The interpretation of the experimental results is not conform to the hypothesis of an enlarged second virtual focal spot by pre-filter usage near the tube. The thin cover of vacu-packed film is of advantage with minimal scattering from the detector device. On the other side, CR cassettes and flat panel detector casings need optimisation especially for higher energies, where a pronounced disturbing scatter contribution was observed. MTF curves are suitable tools for tracing device borne scatter contributions. The resulting unsharpness values, including the scattering from the detector device, are indeed different from results obtained by other methods as line pair based gauges and thus not comparable. The evaluation of spatial resolution with double wire IQIs according to EN 462-5 is insensitive to scattering generated within the detector device, in opposite to the MTF method. Device borne scattering effects disturb 3D-CT reconstructions raising artefacts at higher tube voltages and by beam hardening. Further investigations are necessary for a detailed and quantitative understanding and essential for subsequent numerical correction of these effects. The authors thank C. Bellon for helpful discussions and MCNP calculations.